Happy Thursday! Yesterday, it was back to reality for everyone as the kids went back to school and I went back to work after Christmas and our magical Disney vacation. I had planned to do one big recap of our trip but as I began to plan what I wanted to share with y'all, it was just way too much to do in just one post. So first, I will be sharing my Disney Style! Next week, be on the lookout for Disney Food and Disney 101, which will include all of my personal tips and tricks for Walt Disney World. 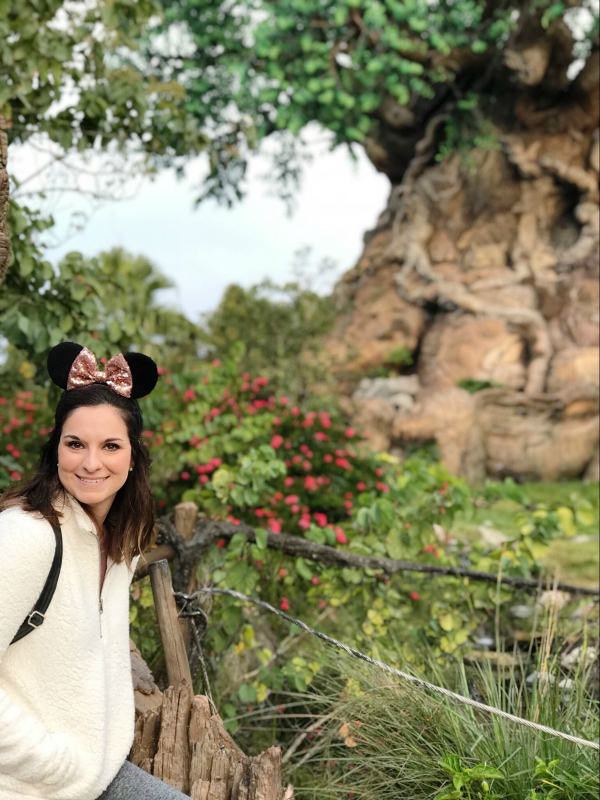 I am by no means a "Disney expert" but I do have some good advice to share that I hope can help out someone else! I found the task of packing for this Disney trip to be a lot trickier than packing for our previous one. Back in June of 2016, we did a three day trip to Disney. It was summertime so I knew what to expect weather wise. It was going to be hot! But in December, Florida weather can definitely be pretty unpredictable. When I looked at the forecast a week out, it showed sunny and a high around 80 almost every single day that we were supposed to be there. But the forecast was wrong! Our first two days were warm and sunny but most of our trip was overcast and chilly. Moral of that story is to over pack. Bring short sleeves, shorts, leggings, long sleeves, jeans, sweatshirts, and a jacket if you are traveling to Disney World in December. I was so thankful for the warm pullovers that I packed in my suitcase when it didn't get above 50 degrees one day! Also, be prepared to dress in layers because it could be chilly in the morning, super warm by afternoon, and then cool again once the sun goes down. You will also need a good backpack for carrying your things. I will be sharing more next week about what you should pack in it. I found my cute Mickey backpack at the H&M outlet. It was perfect for Disney! On our first trip, I made so many footwear mistakes! I apparently had no idea the first go round how much we would actually be walking. I did over 20k steps in Epcot! 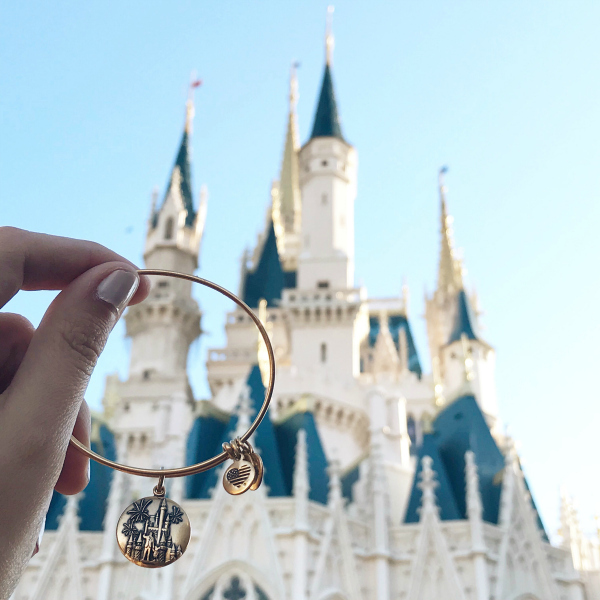 Disney isn't a fashion show if you plan on spending the whole day at any of the parks. Wear comfortable shoes! rotated two pairs of super comfortable Nikes (with socks) every day and I had very little discomfort. Flip flops will kill your feet. Don't make the same mistake I did on our first trip! 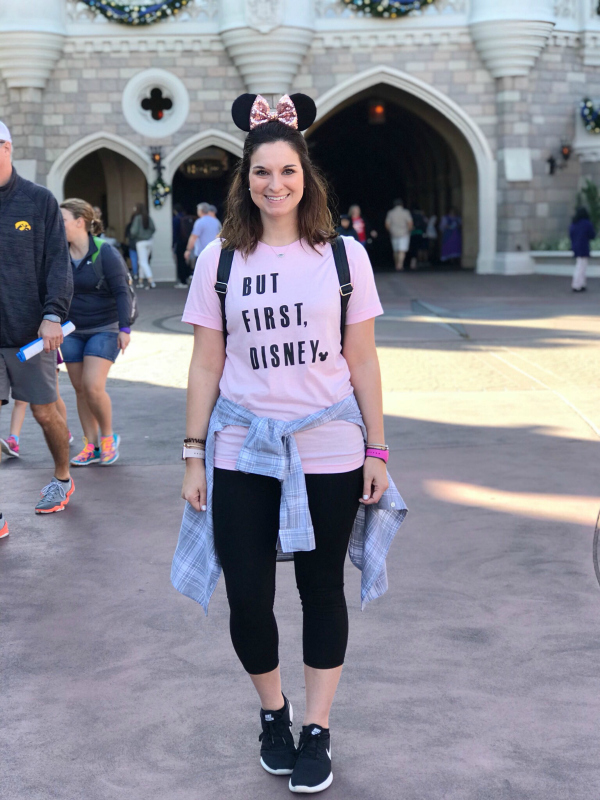 I had so many questions online and in the parks about my Minnie Mouse ears. I can't stand wearing headbands in general because they always hurt behind my ears. I had bought a pair of Minnie Mouse ears in the park back when I traveled to Disney Land when I was in college. They hurt my head so bad! So now I always order my ears from Etsy. 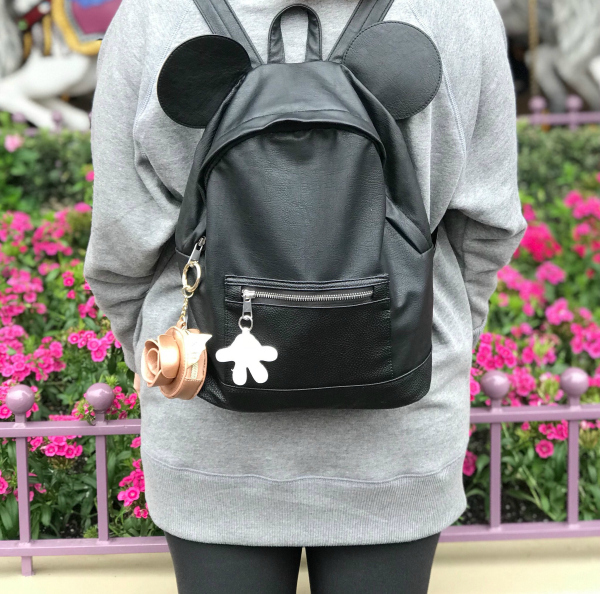 I loved the look of the rose gold ears from the parks so I found a great Etsy shop that sold comfortable ears for way cheaper than the park. I honestly couldn't even feel that I had these on my head. 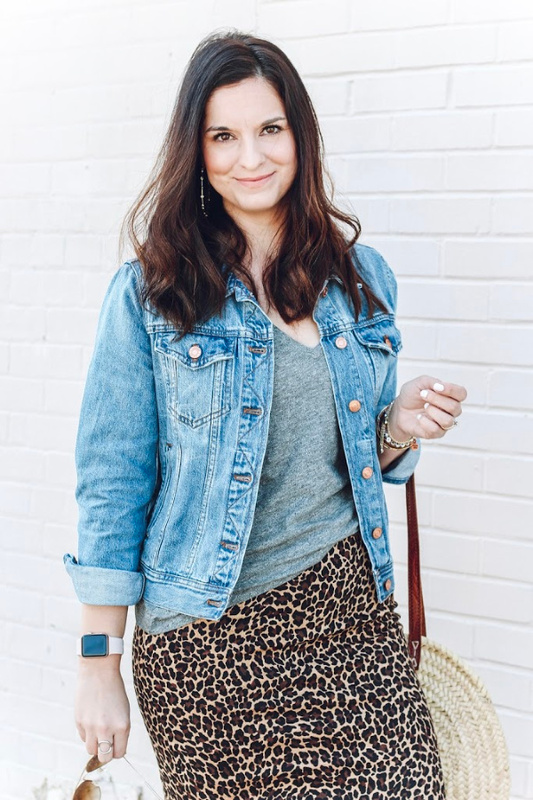 They are so comfortable to wear and are seriously adorable! I would absolutely recommend getting a pair of these for your next trip. 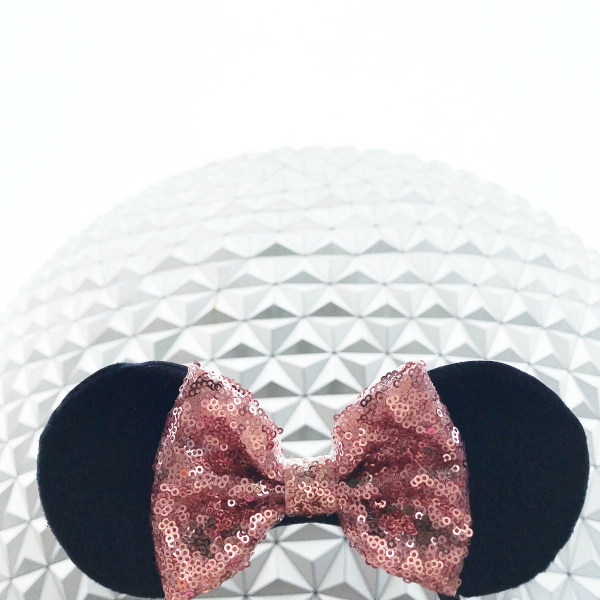 You can even customize the ears and bow! 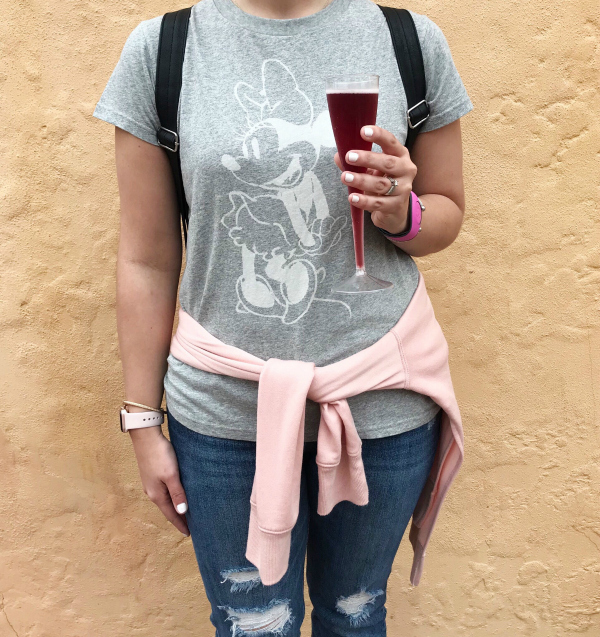 I am all about wearing Disney tees when we go to the parks but with all of the layering we were doing this time, I only bought three shirts for our six days in the park. 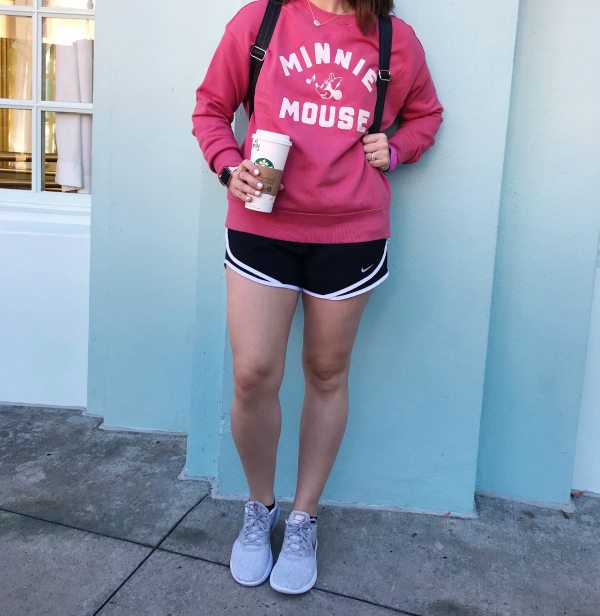 I did pick up an adorable sweatshirt at Disney Springs and it's a cute, warm layer! I also got cute ones for my girls as well! 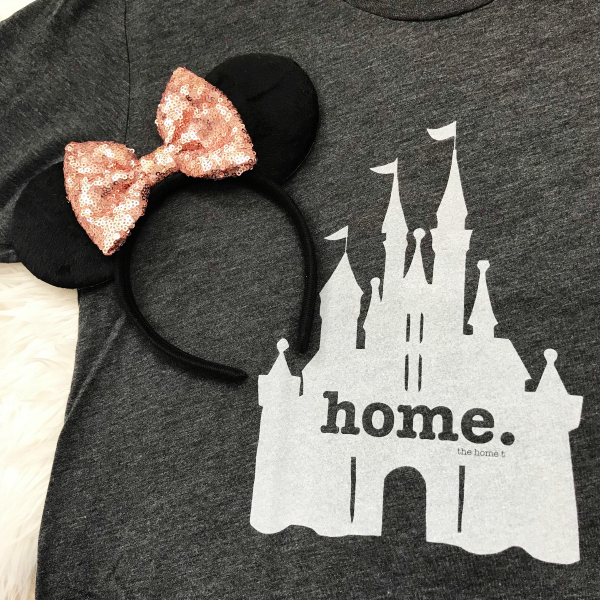 I always have great luck finding cute Disney tees on Etsy but you can also get great deals on super affordable Disney apparel from Uniqlo, where I got our sweatshirts and my gray Minnie Mouse tee. 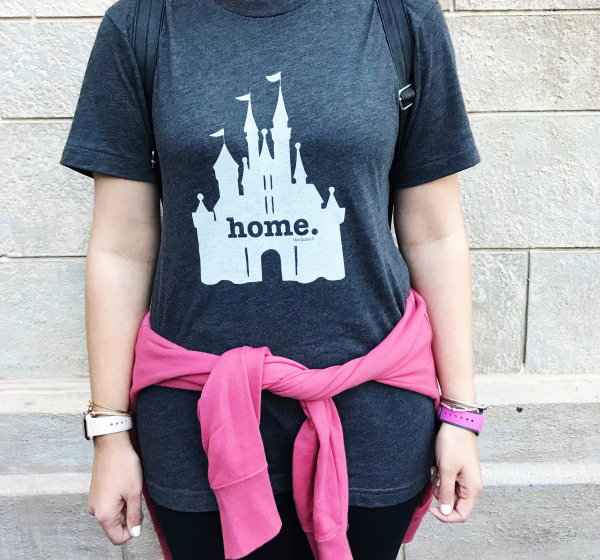 The castle home tee has been on my wish list for so long so I had to pick it up for this trip. It was definitely my favorite! I didn't buy many souvenirs during our trip but there was one item that I knew I had to have. I wanted an Alex and Ani bracelet to wear as a reminder of this trip. I had such a hard time selecting which one I wanted but I ended up getting this one with a castle charm. One of my favorite things about the Magic Kingdom is Cinderella's Castle. It's just so beautiful! 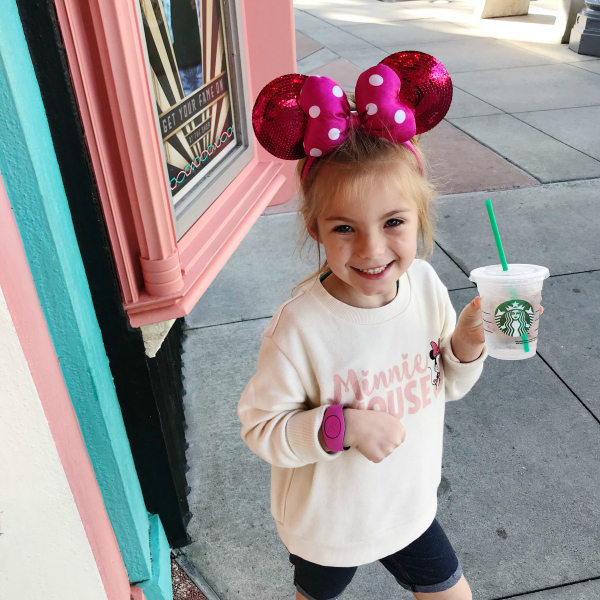 I plan to get a new bracelet each time we visit Disney! I also got an adorable cup that has the rose from Beauty and the Beast inside of it. It's too cute! Thank you so much for visiting! Have a magical day!